The technique of hanging roll wallcoverings is basically the same for all the different types, although individual materials need one or two tricks of their own. First mix up the paste, following the instructions on the packet. Unwrap the rolls of wallcovering, and look carefully at the design to sec which is the top usually the free end, but if it is not, reverse-wind the roll. Next, check the rolls for colour matching, by unrolling a metre or so of each roll and laying them side by side in natural light. Differences in shade are quite rare with machine-printed wallcoverings as long as the batch numbers are all the same, but some slight shade variation may be noticed on plain-coloured wallcoverings, on vinyls, and on certain paper-backed fabrics. Try swapping the order of the rolls around to get a good colour match along adjacent edges. Lastly, check which type of pattern match the wallcovering has random, straight (the pattern at any given point on the left-hand edge of the wallcovering is the same as at the right) or drop (the pattern on the left-hand side is different at any point from that on the right). It does not really matter where you start hanging wallcoverings, although it is traditional to start alongside the largest window in the room. The only exception comes when hanging a wallcovering with a large and bold pattern; then it is usual to centre the first length on the chimney breast or other focal point and to work outwards from there in opposite directions round the room. It is vital that the first length is hung exactly vertically, and a plumb line must be used to mark a vertical line on the wall where the edge of the first length will come. The simplest way of doing this is to make a series of pencil marks alongside the plumb line, and join them up with a long straight-edge. It is useful to have a helper for this. Measure the height of the wall at the point where the first length will be hung, and cut the first length about l00mm longer than this measurement. If the pattern is bold, decide where the first motif will be sited in relation to the ceiling line and cut the paper accordingly. Mark the top of the length on the back of the paper, so you hang it the right way up. If you are banging a succession of full lengths, measure and cut further lengths, but watch the pattern match carefully, especially if it is a drop pattern. Continue cutting full lengths until the end of the roll is reached; unless the pattern repeat is very large or your ceilings are very high, a roll should give four full lengths. Shorter leftovers can be used to paper above doors and above and below window openings. When cutting lengths that have a drop pattern, mark the back of the first length cut 1, and the back of the second length 2. The third length cut will be an exact match for 1, the fourth a match for 2 and so on. Lay the first length of wallcovering on the pasting table, aligning the top with the end of the table and with one edge fractionally overlapping the table edge. Start brushing on the paste, working from the centre of the length towards the edge and the top. Then move the paper over so its other edge fractionally overlaps the other edge of the table, and paste out towards this edge too. Make sure all areas are pasted. When the top part of the length is completely pasted, fold it over with the pasted area inside, move the paper along the table and paste the remaining part of the length. Fold up the bottom edge in the same way. If you gel some paste on the table, wipe it off immediately to avoid transferring it to the front of the wallcovering. When pasting very long lengths (for ceilings or stairwell walls, for example), the paper may have to be folded concertina-fashion instead. Some wallcoverings, in particular heavy and embossed types, should be left for a while after pasting to allow the paste to soak in and make the paper more supple. The instructions on the roll label should tell you about doing this. Pick up the pasted length of wallcovering over your arm, and carry it to the wall. Climb your steps, and unfold the upper fold in the length, allowing the rest of the length to hang down with the lower fold still in place. Do not let the wallcovering drop suddenly or else it may tear. Holding the top of the length between fingers and thumbs, position the top of the length just beyond the ceiling line and locate the edge of the length against the plumbed line on the wall. When it is exactly aligned, use a paper-hanging brush to press the wallcovering against the wall with a series of long, sweeping strokes to hold it in position, working from the centre towards the edges to brush out any air bubbles trapped behind the wallcovering. At the top of the length there should be about 50mm of excess wallcovering. With the top half of the length in place on the wall, unfold the lower part and carry on brushing the wallcovering into place, checking that it is aligned with the plumbed line all the way down. There should be about 50mm excess wallcovering at skirting board level too. Return to the top of the length, and use the back of the blade of your scissors to press the wallcovering into the angle between the wall and ceiling. Peel the wallcovering away, cut along the crease, wipe off any paste which has got on to the ceiling and then use the paper-hanging brush to dab the trimmed end neatly back into the angle. Brush lighlty down the whole length once more, and then repeat the crease-and-trim operation at skirting board level, again wiping off any paste on the skirling board and brush the trimmed end back into place. Fold up the pasted off-cuts, so you do not tread on them, and paste the second length ready for hanging. Ideally, hanging wallcoverings is a two-person job – one hanging the wallcovering and the other pasting. Take the second length to the wall, hold it up at ceiling level as before and align its edge carefully with the first length, matching the pattern by slipping the length up or down as necessary. When the pattern is matched accurately, brush the length into place and trim at top and bottom as before. Finally, go over the scam between the two lengths to make sure it is firmly stuck to the wall. A seam roller can be run down the scam on flat wallcoverings – lay a piece of paper over the wallcovering before using the roller as the roller should not touch the pasted wallcovering. 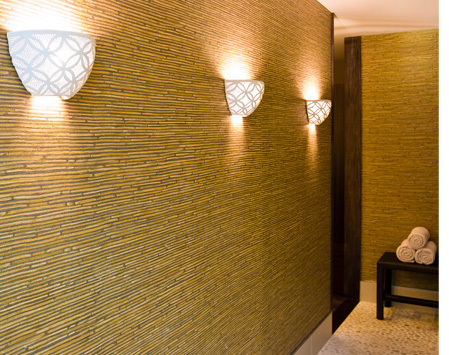 Bui on embossed or hollow-backed relief wallcoverings a paper-hanging brush should be used instead, dabbing the scam firmly with the ends of the bristles; a seam roller will crush the emboss or relief.